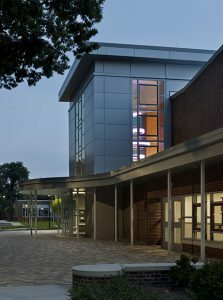 The Connecticut Green Building Council awarded JM Wright Technical High School a 2016 Institutional Award of Merit. J.M. 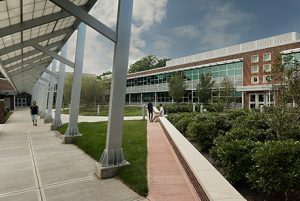 Wright Technical High School in Stamford, Connecticut is the first technical high school in Connecticut to achieve LEED Silver Certification from the U.S. Green Building Council (USGBC). 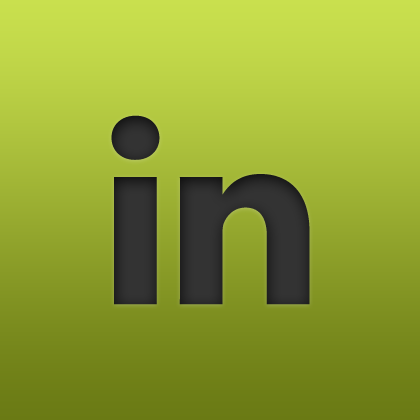 Several sustainable design elements helped J.M. 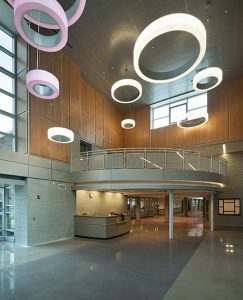 Wright Technical High School achieve LEED Silver Certification. The greatest challenge addressed was to balance optimal outside air ventilation with efficient overall heating and cooling systems. Significantly increased levels of roof insulation paid great dividends to the sprawling, low-rise building. Reusing the existing building and reducing impervious paved surfaces earned exemplary performance credits. Translucent glazing systems were installed to improve light quality and minimize dependency on artificial lighting. This improved ambient natural light contributes to both enhanced task performance and thermal comfort in moderately warm weather. The courtyard is irrigated with rainwater harvested from selected roofs. Most importantly, the school’s proximity to the Mill River Walk system demonstrates that the learning environment is a strong participant in a greener and more sustainable future for the City of Stamford. In 2009, budgetary woes and declining enrollment worked in tandem to close J.M. Wright Technical High School. 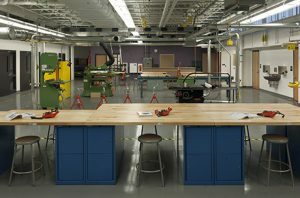 To create a new rigorous learning environment that combines academics and trade programs, the design team worked closely with the Connecticut Technical High School System. The dynamic curriculum prepares students for post–secondary education and in-demand career paths. Renovations to J.M. Wright High School, originally designed by Francis L. S. Mayers in the 1950s, provide the once shuttered school and adjoining Scalzi Park with a dramatic rebirth. When the doors reopened in 2014, 150 freshmen engaged in a variety of programs such as automotive technologies, culinary arts, digital media, health technology, hospitality/tourism, and facilities management. The facilities management program is the first–of–its–kind in the nation at the high school level. Other programs, like hospitality/tourism, digital media, and carpentry establish new standards that are being emulated statewide. The $90 million project transformed the existing building into a 200,000 square foot facility for modern technical and vocational education. A priority was placed on delivering this project in half the time of any other technical high school project. Design and construction schedules were accelerated, requiring significant coordination and integration among the State of Connecticut and the design team. The school’s new design is distinguished by a main street concept, where the existing building is anchored by new multi-level entry volumes. Clad in metal panels with vertical window bays, these new entry volumes emulate a modern corporate working environment. The school will eventually accommodate 700 students. The Connecticut Technical High School System (CTHSS) currently operates 17 diploma-granting technical high schools, one technical education center and two aviation maintenance programs located throughout the state. The system serves approximately 11,200 full-time high school and adult day students, with comprehensive education and training in 31 occupational areas and 2,000 apprenticeship students. CTHSS is the largest high school system in Connecticut, serving all geographic regions and all demographic and diverse populations.